Garden Trellises can be crazy expensive. These incredibly easy DIY Garden Trellis plans give gardeners another option to cultivate climbing plants. The truth of the matter is that no one wants to spend an extra 50 bucks on something if they can make it. 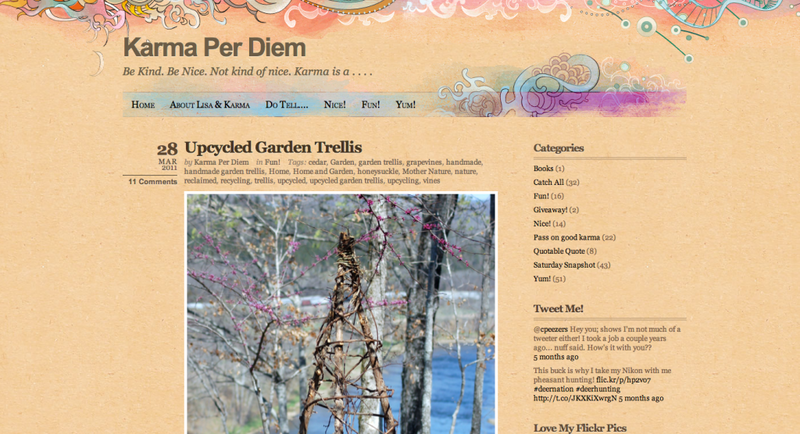 With this garden trellis, you spend nothing but some time and branches. So if you have two hours and a few branches, get out their and start cultivating life! Howdy outstanding website! Does running a blog like this require a lot of work? I have virtually no expertise in computer programming but I was hoping to start my own blog in the near future. Anyway, should you have any ideas or tips for new blog owners please share. I know this is off topic but I just needed to ask. Thanks a lot! I’m impressed, I have to admit. Rarely do I encounter a blog that’s both educative and entertaining, and without a doubt, you have hit the nail on the head. The issue is an issue that too few people are speaking intelligently about. I’m very happy I stumbled across this in my search for something concerning this. Thank you so much! I hope to keep delivering ways to help people cultivate life in short, easily digestible posts. Thanks for the encouragement, it is greatly appreciated. Hi! Someone in my Myspace group shared this site with us so I came to check it out. I’m definitely enjoying the information. I’m book-marking and will be tweeting this to my followers! Exceptional blog and great design. Hi! I could have sworn I’ve visited your blog before but after looking at some of the articles I realized it’s new to me. Anyhow, I’m certainly pleased I discovered it and I’ll be book-marking it and checking back regularly! In these prompts, the children need to explain the group of events which took place in a unique way within their own words. Hi there Dear, are you truly visiting this web site regularly, if so afterward you will without doubt get pleasant knowledge. It’s truly a nice and useful piece of info. I am glad that you just shared this helpful info with us. Please keep us informed like this. Thanks for sharing. Easy, and Beautiful | Cultivated. I do have some questions for you if you tend not to mind. Thank you for some other wonderful post. Where else could anyone get that kind of information in such a perfect way of writing? I’ve a presentation next week, and I’m at the search for such information. great points altogether, you simply won a new reader. What may you recommend about your post that you simply made some days in the past? Any positive?